TAIZHOU, China- A test to see how well a city is run is to count how many blocks you must walk with garbage in your hands before coming to a municipal trash can. One or two blocks is good; up to five is average; 10+ means you may as well just toss your trash on the ground or stuff it in your pockets to take home. There is a direct connection between frequency trash cans and litter: places that have places to dispose of rubbish easily accessible generally don’t have much litter and vice versa. I don’t know how often I’ve searched for trash cans in vain during my travels in Latin America, SE Asia, and India. In some places I think the rubbish bin concept has yet to be imported. In so many places in this world the standard operating procedure for depositing trash when you’re in public is to throw it on the ground. China is not one of these countries. In China there are trash cans everywhere. There is truly no reason to thrown your trash in the streets here. There are usually garbage cans every block or two in downtown areas, at comfortable intervals in the outskirts, and you hardly ever need to walk for more than a minute or two with your hands laden with trash. 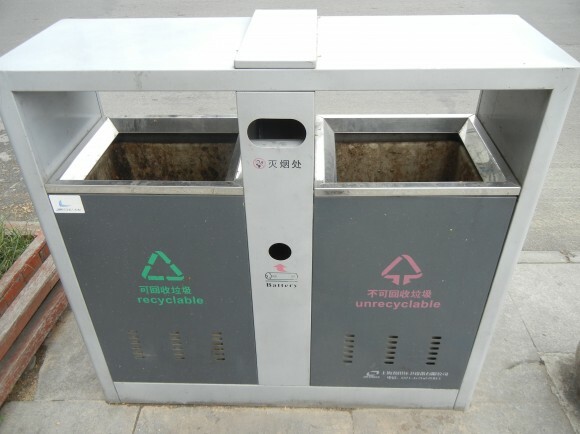 Not only do many Chinese cities have trash cans placed at frequent intervals but they are also emptied regularly. There is a virtual army of trash collectors that work in units and scour the cities of China in search of ill-deposited rubbish and emptying trash cans. They also clean the unbagged piles of garbage that businesses place out at the edge of the sidewalk or in the gutter in front of their shops. Though, I have to admit, even with trash cans everywhere many people in China are still in the habit throw their trash on the ground. It is also common for the unbagged business trash piles in the sidewalks gets scattered around a little. These instances make some places appear a little dirtier than they really are: the life expectancy of litter in China is incredibly short, the streets are cleaned almost obsessively. The effect of this is that the streets in the cities of China are pretty clean on a global scale. The trash can is a rare device for a large part of the world. The concept that somebody must empty out these rubbish receptacles when they get full is even rarer. I don’t even want to mention the odysseys that I’ve had to go on to find a trash can in many of the world’s cities. If I’m walking down the street holding some trash and I can’t find a trash can for five or six blocks I throw it on the ground. Chances are that this is the standard operating procedure in these places and the streets are strewn with trash anyway. People who don’t seem to care about living in rubbish heap don’t clean litter — so why should I care when just passing through? Even the cities of Haiti — the poorest country in the Western hemisphere — clean their streets each morning. For the amount of people living in the urban districts of China — a 500,000 person city here is considered small — the streets are amazingly clean. A clean city is often a well run city where things function smoothly and efficiently. If a city can mobilize, organize, and fund enough people to keep in clean, it can do just about anything. I lived one year in China and you are so right, streets are so clean! True, in India there are no trash cans, especially if you go up north, in the Uttarakhand state, trash cans are illegal. They have a different way to collect the waste, which might work if you live there, but for tourists is a pain.. Yes, it’s real nice here in China. That’s interesting about trash cans being illegal in Uttarakhand state of India. I guess if people don’t use or empty the trash cans anyway what’s the point of having them? Thanks for the comment and for getting in touch. Good site by the way. In Japan, trash cans are hard to find, but it is one of the cleanest places I’ve been. I think it has more to do with cultural conditioning. In Japan, I was very aware of my garbage and had to keep it with me until I could find a trash bin. Japan is a very interesting place, for sure. It’s interesting though to look at the different ingrained reactions people have to littering. Some cultures it’s completely taboo in others something nobody seems to think about. Wade, that’s what I love about you: An article about trash cans and I learn about the world. Even trash cans can tell us something about a people. Here’s my little definition of wealth: access to paper towels. In every bathroom I have a paper towel rack along with 2 toilet paper dispensers. And in the kitchen I have two paper towel racks. I make sure they’re never empty. Just one of my obsessions. Right on! Paper towels are a financial litmus test, so to speak. Though I have to admit that we just began using them, and they’re pretty cool — especially with the kid (and me) making messes all day haha. Thanks for the comment. Interesting point about Mexico City – depending on the borough (delegacion) there are lots of trash cans or hardly ever. I live in a mixed income neighborhood (seriously, there are low income, middle income, and rich people living on the same blocks, it’s such a refreshing change for DF) in a rich borough (Miguel Hidalgo) so there are trash cans galore! However, when I cross into Condesa, which is a rich neighborhood in a poorer borough, there are hardly any trash cans. It’s annoying when I scoop up dog poo and walk with it for 15 minutes. But… strangely enough Condesa is cleaner than my neighborhood. Go figure. That’s interesting. I guess we have to return to Steve’s comment about cultural conditioning. Maybe this is a rich culture vs. poor culture paradox. Also, I can see the sky through your ears! Haha, yes, you can. No amount of smog or pollution could stop that. If your Shanghai, Suzhou, Chengdu or Shenzhen, Yes, China looks decently clean, but step into a typical suburb or smaller city in a middle province and the habit of throwing trash onto the ground becomes the local style. I’ve lived and worked in China for nearly a decade and I would say this is one of the greatest pet peeves I harbor for the locals. Thanks for the comment. True, people here do tend to litter more but there are often someone whose job it is to pick it up somewhere nearby. I’ve crossed the country hitchhiking, traveled between many cities on foot, and been all over and it’s my impression that the streets of China tend to be vastly cleaner than most of the other countries I travel in. Today I just walked 30km out of Taizhou into pretty much the middle of nowhere and there were trashcans and people peddling little bicycle carts emptying them and picking up litter. I guess if you compare China to Scandinavia or Canada it looks pretty dirty, but compared to Latin America or many other countries in the tropical belt it’s my impression that, on the whole, the streets are impressively well kept. In India everyone thinks that someone else will clean it after they make a place dirty- the training should begin at home-but the basic hygiene is never taught at home-whether it is toilet, sink or surroundings of the house- people always watch TV -cricket, eat and sleep- no middle class person ever works with a broom or mop or throw garbage . Upper class depend upon servants-lower class do not care! See the railway lines-platforms and roads- what is the use of launching lunar vehicles- Indians will pollute Moon also!